Sarah loves when the music is following the dancer rather than the other way around. Sarah Scott has been competing, performing and instructing for the last 7 years at a national and international level. She is a Master Trainer for XPERT Pole & Aerial Fitness and currently travels the world teaching workshops and hosts training packages in South West England. Being a brand ambassador for XPOLE has led to representing them at events such as BeFit, FIBO, Rimini Wellness and has presented at the International Fitness Showcase for the past 4 years. Sarah loves her strength moves and her biggest passion is to pass on her knowledge in both pole and physical training. 1. Sarah, could you please tell me about yourself? How have you come to pole dance? What was your biggest challenge when you started? How was your process of becoming a professional pole dancer and instructor? What and who inspired you when creating your own style? I came to pole by accident really! I went with a friend to a class for support but ended up falling love with it! I was at a bit of a crossroads in my life and decided to re-train as a fitness instructor and pole instructor and opened my studio. There were a few different styles emerging – the graceful and bendy style seen with Felix Cane and then the more strong and powerful style like from Zoraya Judd. 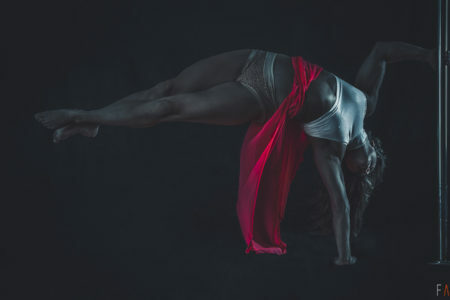 I didn’t come from a dance or gymnastic background and found my flexibility was a little limited at the beginning so was more drawn to the strength side. 2. Why have you chosen pole? What is special in it for you? What other aerial arts are you doing? For me it’s the varied training. It’s constantly challenging and massively rewarding. You can dance in different styles, different techniques – and the community is so inspiring. I’ve trained aerial hoop a little and tried aerial silks but found I don’t have the time to dedicate to them with everything I have going on. I fully respect all the aerial arts, as it is incredibly hard to make look effortless. It’s that respect that keeps me from taking them further as at the moment – I look far from effortless! 3. How does your usual day look like? How long and how often do you train and stretch? How long do you warm-up and stretch before the performance? My usual day starts around 8-9 am depending on where I am. I play with my dogs and have some breakfast – usually something with eggs and avocado. Then I catch up on emails before I head to my gym which I share with my fiancé. I have 2 poles, a weights area, rowing machines and some gymnastic equipment and we’ll pretty much spend the rest of the day there! I usually do 1 – 2 sessions if I’m at the gym and that can include pole training, weights, circuits, or stretching or a mixture of them! 4. Do you travel a lot giving workshops and performing? Could you please share some funny or maybe unexpected episode during your performances? I travel every weekend at the moment teach workshops and teacher training for XPERT – every other month or so I will judge a competition where I usually do a guest performance also. I once was performing at a show in LA and there were 4 poles on stage with audience seated all around. I hadn’t practiced with this set up so when it came to perform I ended up getting disorientated and went to the wrong pole. In the moment I made a bad decision and rather than moving over to the correct pole I started climbing the wrong pole and just remember thinking “Where are you going! Now you have to find a way to dance down!” The internal dialogue onstage can be amusing! 5. How do you create your pole dance transitions? Could you give some tips for interesting transitions? For transitions I like to put together a great playlist of music – some new, some old and then film free styling. After watching it back, I try to find sections I want to develop and then I do the process again, but this time work with the idea to make it smoother. 6. How is your creative process when preparing choreography? How do you choose your music for your performances? My creative process can vary, but in general I start with the song. I research and search for music and then freestyle to a few until I find one that I can start to see a performance with. 7. What is the most important in a pole dance performance in your opinion? 8. What are your 2 favorite pole tricks and how to do one of them? It´s so hard to pick favorite pole tricks! But I love invert rolls because you feel like you flying and look like your flipping! And power spins on static. You need to really pull down through the lats and keep lifted, start with enough distance from the pole to create opposition as you fly around the pole. So many variations, but always looks great. 9. What advice can you give to those who want become pole dance instructors? You have to give up a lot of your own training time and it’s a different skill to develop. Make sure you know how to break moves down in a variety of ways to suit different learners. Everyone needs to succeed in at least some thing during class and learn how to spot safely and effectively. 10. What tips can you give for good pole drops and flips? Go see an instructor who has lots of experience in this area and use safety mats. They just aren’t worth learning on your own. There are some simpler moves (like the invert roll) that look like a flip but aren’t nearly as difficult or dangerous to achieve. Start small and don’t rush. 11. What is the best supplement for a pole dancer to add to the daily meals? This will vary hugely on the current diet, goals and training etc. But one I like to add in is a BCAA drink – Branched Chain Amino Acids. These are like the building blocks of muscle and can aid with muscle repair. They are usually fruit flavoured and light and are very easily absorbed so can be used as a great energy source during training too. 12. What are the common mistakes that pole students do, in general or in 1-3 tricks as examples? So a few mistakes I think we all can make is getting frustrated when we don’t get something right away. We have to give our central nervous system time to adjust to what we’re doing, as our bodies don’t recognize these new movement patterns. Try to think of it as a weak signal at the beginning and more you do it, the stronger the signal and the easier the move gets. Another is not focus on alignment of the shoulders during pretty much everything! Just because something doesn’t hurt, doesn’t mean its not causing issues further down the road. And a trick example I would say the Iron-X as its so popular: People tend to focus on the legs but if you focus on bringing the shoulders in line and lowering the hips slowly it allows the oblique’s to fire and then the legs will follow. It’s not quite as simple as that – but if a student is close this can be a good fix. 13. Where one can book you for a show? Do you also give classes and workshops? My website has all of my workshop info and upcoming schedule. And my training packages are run in Somerset UK, where you can stay from 1-3 days and train at my facility in a variety of ways from pole, gym and mobility. 14. Are there some giveaways to share? And I’m currently giving away free drinks bottles with any Protein order on my website. Master Trainer for XPERT Pole & Aerial Fitness and Pole Performer.